HÀ NỘI — The Ministry of Industry and Trade plans to enhance the application of e-commerce with the aim of narrowing the digital divide, an official said at the Việt Nam Online Business Forum 2019 held on Tuesday in Hà Nội. Nguyễn Hữu Tuấn, a representative from the ministry’s Việt Nam e-Commerce and Digital Economy Agency, said that narrowing the digital divide across the country was important. Narrowing digital divide remained a significant challenge to Việt Nam, the Việt Nam e-Commerce Association (Vecom) said in its report about the e-Business Index (EBI) 2019 released at the conference. The report revealed a huge gap in e-commerce development across the country’s 63 provinces and cities. Việt Nam’s EBI averaged 40.3 points, 2.8 points higher than in 2018. EBI is based on infrastructure and human resources, business-to-consumer, business-to-business and business-to-government transactions. HCM City took the lead in EBI with 86.8 points, double the country’s average and nearly 60 points higher than Bắc Kạn, which was at the bottom of the list. Hà Nội came second with 84.3 points, followed by Hải Phòng (59.6 points) and Đà Nẵng (57.5 points). However, the gap between the top five localities’ average EBI (68.4 points) and the average EBI of the five localities at the bottom of the list (29 points) increased to 39.4 points from 36.7 points in 2018 and 18 points in 2013. Vecom said there was a significant difference in e-commerce development between localities and it was widening. It was easy to understand that e-commerce tended to develop rapidly in major cities rather than others but it was important for Việt Nam to narrow the digital divide, Vecom said. Other barriers to the development of e-commerce were the lack of consumer trust and limited logistics services, Vecom said. According to Tuấn, besides narrowing the divide, the ministry would also focus on completing an e-commerce legal framework to protect the rights of consumers, especially on preventing the sale of counterfeit and poor-quality products, as well as developing an e-commerce trade promotion programme for the 2021-25 period. 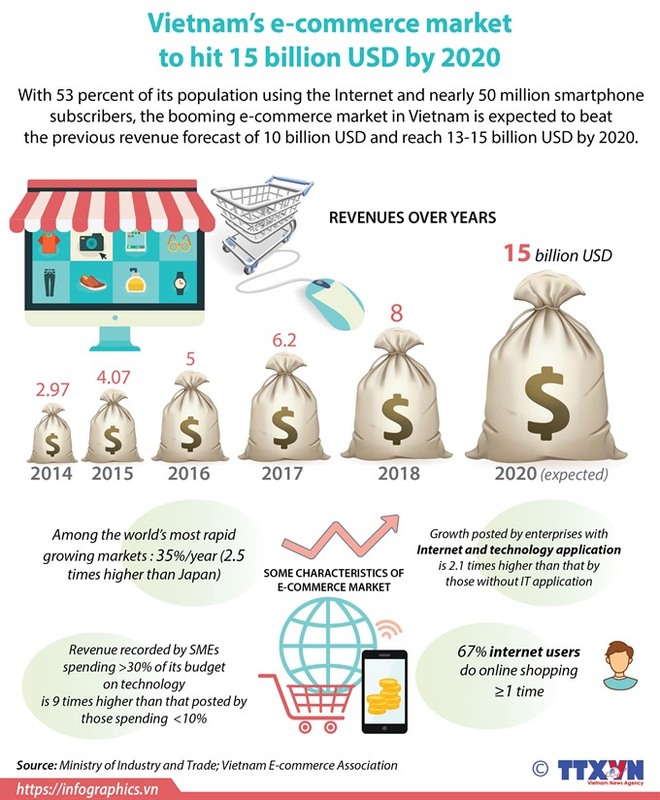 E-commerce boomed in 2018 with a growth rate of more than 30 per cent, according to Vecom, rising from US$2.2 billion revenue in 2013 to $7.7 billion. Lại Việt Anh, deputy director of the Việt Nam e-Commerce and Digital Economy Agency, said that revenue from Việt Nam’s e-commerce market was predicted to reach $13-15 billion in 2020, beating the Government’s target of $10 billion. According to Vecom’s report, cross-border trade had become an important channel for exports and it was estimated that around 32 per cent of Vietnamese small and medium-sized enterprises had established business with foreign partners through online channels. On the same day, the Central Institute for Economic Management (CIEM) also organised a workshop about digital trade and opportunities for Việt Nam. CIEM’s Director Nguyễn Đình Cung said that digital trade was expected to create significant value for Việt Nam. A report by AlphaBeta Company showed that digital trade could bring economic value worth VNĐ953 trillion (US$40.5 billion) for Việt Nam in 2030, from VNĐ81 trillion in 2017.